We believe that one of our missions is to take on environmental issues by using our knowledge and ability in order to preserve the global environment which cannot be replaced with anything. We take on environmental issues from a global perspective through corporate activities and make an effort to reduce resources, waste materials, and environmentally hazardous substances in order to improve both our contribution to society and customer satisfaction. Our motto of “creating the future” is applied to environmental issues. We actively contribute to realize a sustainable society in which the global environment is preserved and dreams of the future generation are protected. We fully understand how our business activities influence the environment, and set environmental goals and objectives for each division in the company to build and operate the environmental management system, and try to improve the system continuously by reviewing it as necessary. We comply with environmentally-related laws and regulations, customer requirements, other requirements, and environmental preservation matters that we specify as a main goal. Among the various influences that our business activities have on the environment, we focus particularly on the following in order to prevent environmental pollution. We engage in business activities that have positive influences on the environmental in order to contribute to the preservation of the global environment. We make an effort to cut down energy and resources that we use for business activities in order to reduce the consumption amount. We also collect and manage resources to be recycled. We provide all our employees with environmental education and conduct public relations activities in our company so that they understand the environmental policy, raise environmental awareness, and improve their ability to make suggestions. This enables us to engage in activities to protect the environment. This environmental policy may be made public according to requests from outside the company or as necessary. 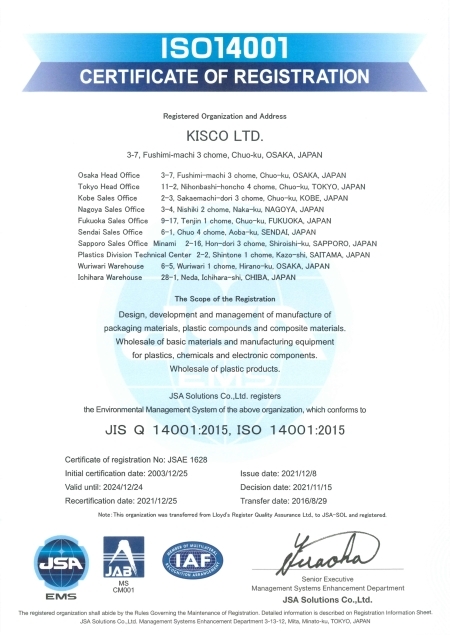 As a material providing company, we make efforts to engage in environmental preservation activities such as the use of a direct molding system (by our CM team) which is a energy and resource saving production system, development of semiconductor process chemicals, and eco-peeler which uses only environmentally conscious agents. In addition, we promote the planning, development, and sales of environmentally conscious products and services.